January 14, 1924 – The commissioners of the South Park Board convene in a special session to accept the donation of a fountain for Grant Park from Miss Kate Buckingham, the fountain to be built in honor of her brother, Clarence Buckingham. Miss Buckingham contributes $250,000 for the construction of the fountain with another $135,000 set aside in a trust fund for its maintenance. The fund will be administered by the Art Institute of Chicago. The fountain opened to the public on May 26, 1927. The Chicago Park District’s description of the fountain, the centerpiece of Grant Park, the city’s “front yard,” includes the following: “An important Chicago art patron and philanthropist, Kate Sturges Buckingham (1858 – 1937) was the last member of the Buckingham family. Originally from Zanesville, Ohio, the Buckingham family made its fortune in grain elevators, real estate and steel. Kate and her brother Clarence Buckingham (1854 – 1913) were both avid art collectors and benefactors who donated valuable prints, paintings, sculptures, and objects to the Art Institute of Chicago… Architect Edward H. Bennett of the firm Bennett, Parsons and Frost, designed the fountain and French artist Marcel Loyau produced the sculptural elements. Architects Jacques Lambert and Clarence W. Farrier served as associates on the project. The fountain is composed of pink Georgia marble, with some granite elements, and bronze sculptures. During the planning phases, Kate Buckingham expressed that she wanted the fountain’s lighting to emulate ‘soft moonlight.’ According to an early Chicago Park District brochure, ‘though advanced in years,’ Miss Buckingham ‘worked night after night with technicians, trying out various colors of glass and adjusting the control of electric current’ to produce ‘blends… that pleased her— and indeed, there is a mystical aura around the lighted fountain suggesting moonlight— in fairyland.’” The above photo shows the fountain under construction in 1925. January 14, 1927 -- The report of George M. Wisner's testimony before Charles Evans Hughes, special master of the United States Supreme Court, is printed. Eisner, the consulting engineer for the Chicago sanitary district, attempted to answer the demands of Wisconsin and five other Great Lakes states seeking an injunction that stopped water diversion from Lake Michigan into the Chicago River. 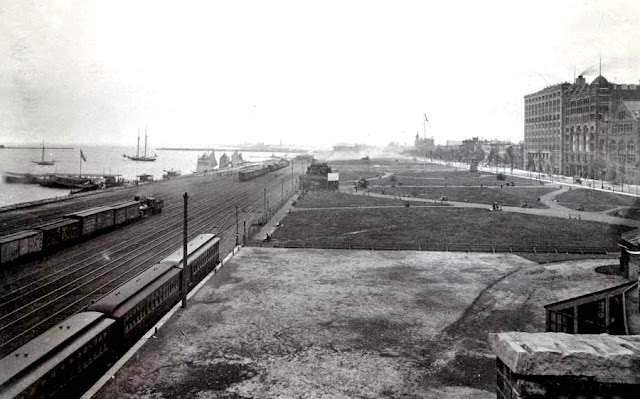 Eisner recounted what life in Chicago was like before the river was flushed with lake water. 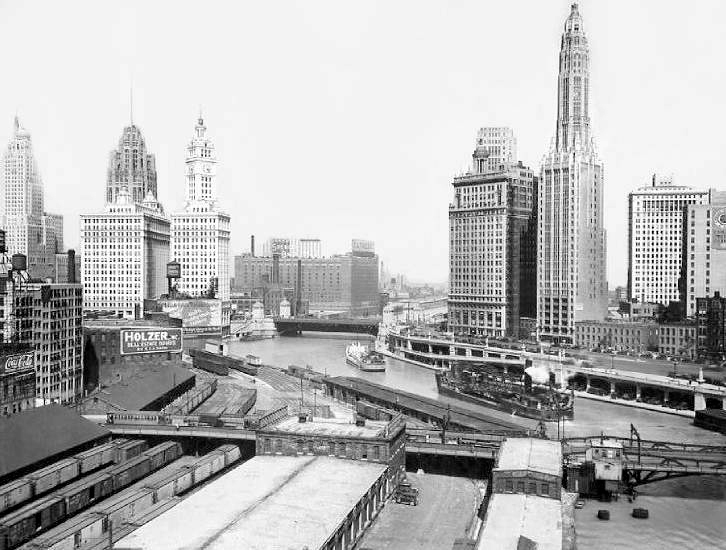 He said, "The Chicago river was a pest hole of typhoid and intestinal disease germs . . . It was a big septic tank festering on the bottom and sending upwards dangerous poisonous gases. The crust of filth sometimes became so thick that a chicken could walk across the river. At other times the crust caught fire." To avoid a return to those days, Wisner asserted that a maximum of 10,000 cubic feet of lake water per second was needed to cleanse the river. 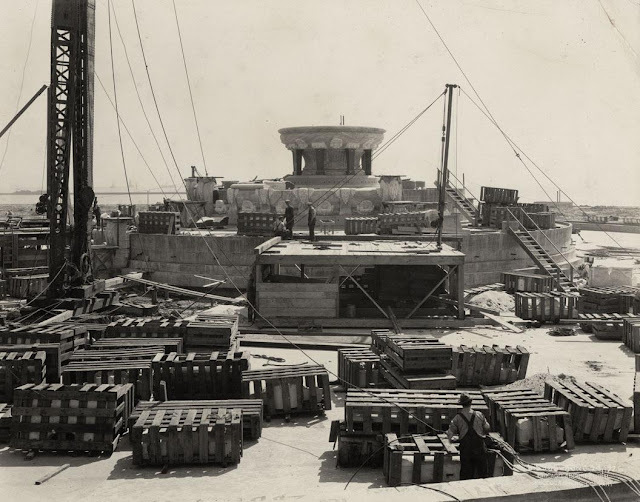 Chicago lost the battle when the Supreme Court decreed on April 21, 1930 that the diversion of lake water be gradually reduced to 1,500 cubic feet per second by December 31, 1938. The photo above pictures the river as it looked about the time Wisner offered his testimony.